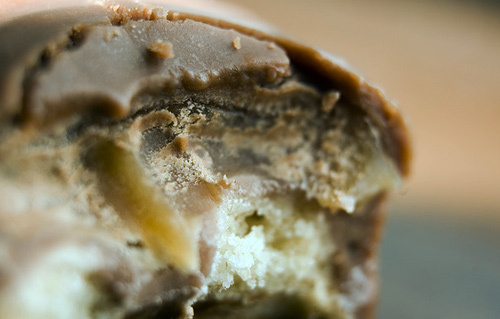 The Twix brand is owned by Mars, a company that also makes M&Ms, Snickers, Starburst, and other convenience store candies. Milk Chocolate (Sugar, Cocoa Butter, Milk Ingredients, Cocoa Mass, Lactose, Soy Lecithin, Polyglycerol Polyricinoleate, Artificial Flavour), Enriched Flour (Flour, Niacin, Reduced Iron, Thiamine Mononitrate, Riboflavin, Folic Acid), Sugar, Hydrolyzed Palm and Palm Kernel Oil, Corn Syrup, Milk Ingredients, Dextrose, Salt, Cocoa Mass, Sodium Bicarbonate, Soy Lecithin, Soybean Oil, Artificial Flavor. Twix’s ingredients surprised me. In a good way. The artificial flavor in the milk chocolate is likely vanillin and there’s a little bit of artificial flavoring used elsewhere—otherwise this is a decent real food showing for processed, high-markup candy.